4 Corporate Welfare for Coal greenpeace.org Peabody Energy in particular has pursued an aggressive strategy, including legal challenges against the Clean Power Plan, lobbying, campaign contributions, and misleading public relations efforts. By providing subsidized access to federal coal to these companies, the federal government has ultimately helped fuel the coal industry’s attacks on federal climate policy. The moratorium on new coal leases and comprehensive review of the federal coal program provide an important opportunity for policymakers and communities impacted by the coal industry to consider new approaches. Instead of continuing to give the biggest coal mining companies subsidized access to billions of tons of publicly-owned coal, the federal government should assert its right – and responsibility – as owner of one of the largest coal reserves in the world, and manage federal coal in ways that support US efforts to address climate change, consult with communities impacted by coal mining and transport, and help ensure a just transition from coal to clean energy. Most of the coal mined by the three biggest coal companies in the US belongs to the American public The US coal mining industry has fought federal policies aimed at addressing climate change and reducing air and water pollution, sometimes using rhetoric characterizing these health and environmental protections as a “war on coal.” Yet what has often been left out of the public debate around federal policies affecting the coal industry is that the biggest coal mining companies in the US actually depend on federal coal for the vast majority of the coal they mine. In fact, federal coal accounted for more than three-fourths of the coal mined by the top three coal mining companies in the US, Peabody Energy, Arch Coal, and Cloud Peak Energy. While this coal belongs to the American public and is managed by the Interior Department, mining companies have leased billions of tons at subsidized rates through a process that they have largely controlled. While the Interior Department’s Office of Natural Resources Revenue (ONRR) tracks the quantity of federal coal mined by each company in order to assess royalties, that information has not been made publicly available. This report shows the results of a Freedom of Information Act (FOIA) request for the quantities of federal coal produced by each coal mining company and subsidiary in 2014.  We compiled the data from that FOIA request for each company’s subsidiaries, in order to calculate the total amount of federal coal mined by Peabody Energy, Arch Coal, and Cloud Peak Energy in 2014. Then we compared those results to the total 2014 coal production from each mine operated by those companies and their subsidiaries, as reported by the Mine Safety and Health Administration (MSHA), as well as to each company’s total 2014 US coal production as reported in company 10-K filings with the Securities and Exchange Commission (SEC). This provides the first detailed assessment of the extent to which major US coal mining companies depend on federal coal. Peabody Energy, the largest US coal mining company, mined a total of 189,500,000 tons of coal in the US in 2014, according to the company’s 10-K filing with the SEC. FOIA results show that Peabody Energy and its subsidiaries mined 129,313,326 tons of federal coal in 2014, 68% of the company’s total US coal production. Arch Coal, the second largest US coal mining company, mined a total of 132,614,000 tons of coal in the US in 2014, according to the company’s 10-K filing with the SEC. FOIA results show that Arch Coal and its subsidiaries mined 110,132,055 tons of federal coal in 2014, 83% of the company’s total. 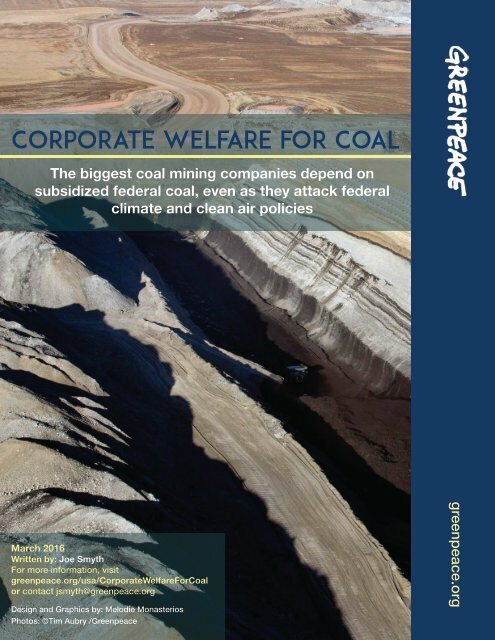 Corporate Welfare for Coal greenpeace.org 5 Cloud Peak Energy, the third largest US coal mining company, mined a total of 85,800,000 tons of coal in the US in 2014, according to the company’s 10-K filing with the SEC. FOIA results show that Cloud Peak Energy and its subsidiaries mined 75,469,617 tons of federal coal in 2014, 88% of the company’s total. The combined total US coal production in 2014 from these three companies, Peabody Energy, Arch Coal, and Cloud Peak Energy, was 407,914,000 tons, which represents over 40% of all the coal mined in the US in 2014, 1,000,049,000 tons.3 FOIA results show that these three companies mined 314,914,998 tons of federal coal in 2014, 77% of their combined total US coal production. FOIA results for the three largest companies, organized by subsidiary and parent company, are available in Appendix 1. The FOIA results also include federal coal production data for several other smaller coal mining companies, which along with the three largest companies show 407,039,077 tons of federal coal mined in 2014. Peabody Energy’s 129,313,326 tons of federal coal production in 2014 represents 31.8% of that total, while Arch Coal’s 110,132,055 tons was 27%, and Cloud Peak Energy’s 75,469,617 tons was 18.5% of the total. Combined, Peabody Energy, Arch Coal, and Cloud Peak Energy accounted for 77.3% of the total federal coal production from all companies and subsidiaries that were reported in the FOIA results. The full FOIA results, including federal coal production data for companies and subsidiaries besides the top three companies that are the focus of this report, are available in Appendix 4.